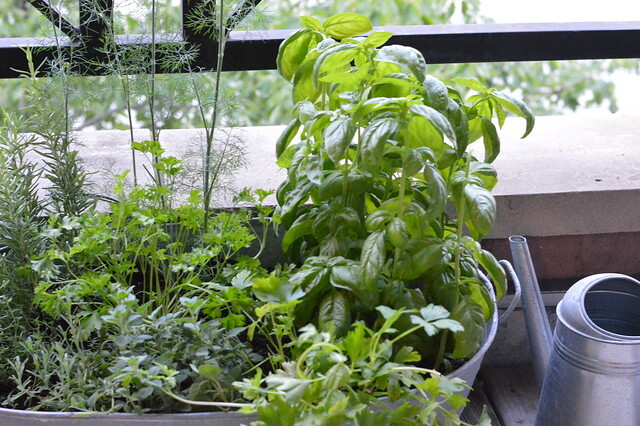 I spend my summers keeping herbs on my front balcony, as well as growing vegetable on my rooftop garden. I have some what of a green thumb, and I really love going up to the roof to gather vegetables that I have grown and incorporating them in my dinners. Additionally, I am fortunate to live across the street from a Chicago Patchwork Farms, a vegetable farm dedicated to transforming city land into community space and improve accessibility of healthy food to neighbors. I can literally walk across the street and buy fresh produce right there; it is truly amazing. This summer I have been consciously trying to eat less meat and make my diet more vegetable-forward. I have not cut out meat completely, but I have made an effort to try and get creative in the kitchen and make more vegetarian dishes. It has been fun! My easy go-to weeknight dinner is a simple pasta, that showcases seasonal vegetables, and is diverse in that you can use whatever vegetables you have on hand, or whatever is in season at your local farm stand. I love being able to incorporate veggies from my garden, and herbs that grow on my balcony. What I love about this uber simple recipe, is that as I said before, you can change it up. Though I have made it both with a pesto sauce, and simple olive oil and fresh lemon juice, I absolutely love making a simple tomato sauce with fresh herbs to really highlight the freshness of the vegetables. Of course you can use a can of store bought pasta sauce, especially if you are in a pinch and looking for a light and healthy meal in under 20 minutes. There is something so wonderful about a dish that highlights seasonal vegetables and fresh herbs without requiring much energy or time. 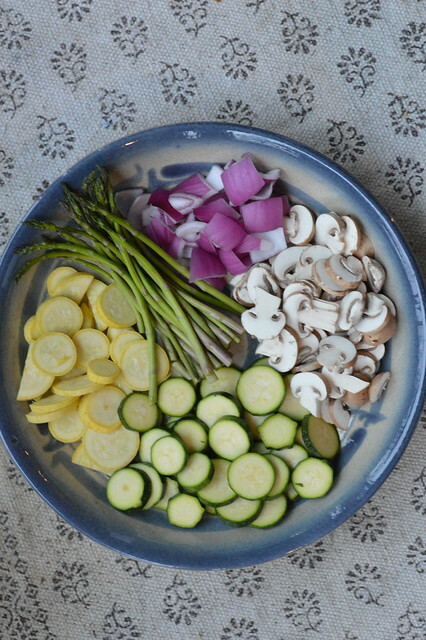 I recommend summer summer squash such as zucchini and yellow squash, red onions, button mushrooms, asparagus, snap peas, carrots, peppers and eggplant. Heat a pot of water over high heat, and cook any pasta according to directions. 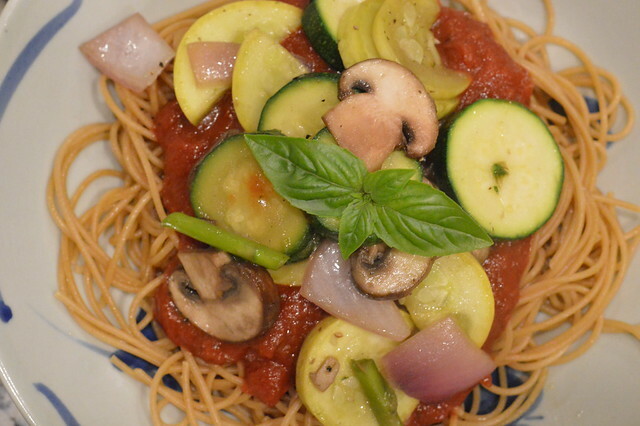 I am partial to whole grain spaghetti for this dish. 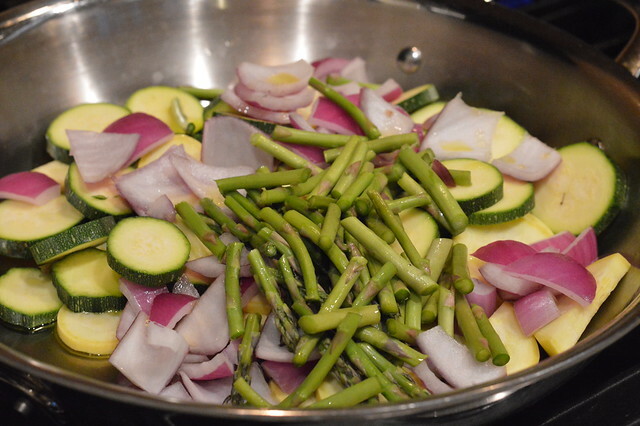 Begin to sauté the firmer vegetables first, such as the onions, peppers, and squash. 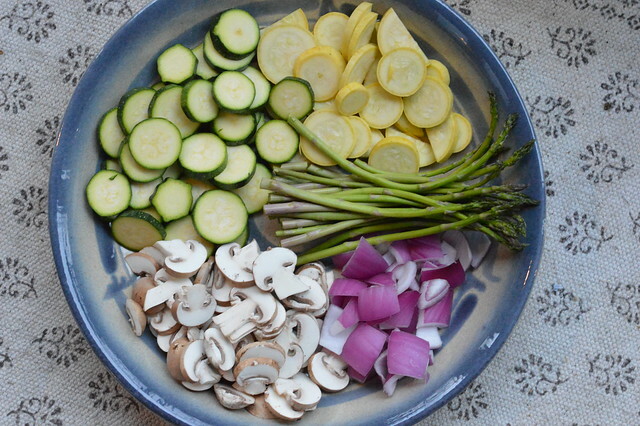 After those vegetables begin to soften over the heat, you can add the mushrooms, eggplant, and other less firm vegetables that take less time to cook. Once the vegetables have cooked through, and are now soft but still firm enough for a little crunch, remove them from them heat. Drain the pasta and add it to your bowl. Top with the sauce, and then vegetables. Finish with fresh Parmesan cheese and basil.